Blog entries on food shops. See how much I buy and for how much. 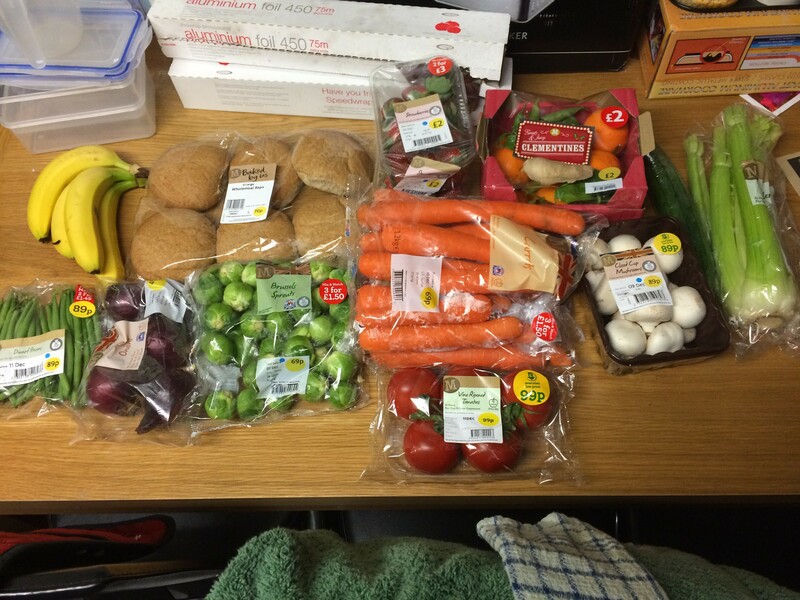 Here’s my food shopping post as promised. I went to Morrison’s yesterday as I had my £5 voucher I collected just before Christmas and wanted to get it used up. I also stocked up on a few bits and pieces so this shop was a bit higher. I think I will need to do a tiny top up shop mid-week though as when I went there was no beef mince so I am currently missing the main part of my cottage pie. 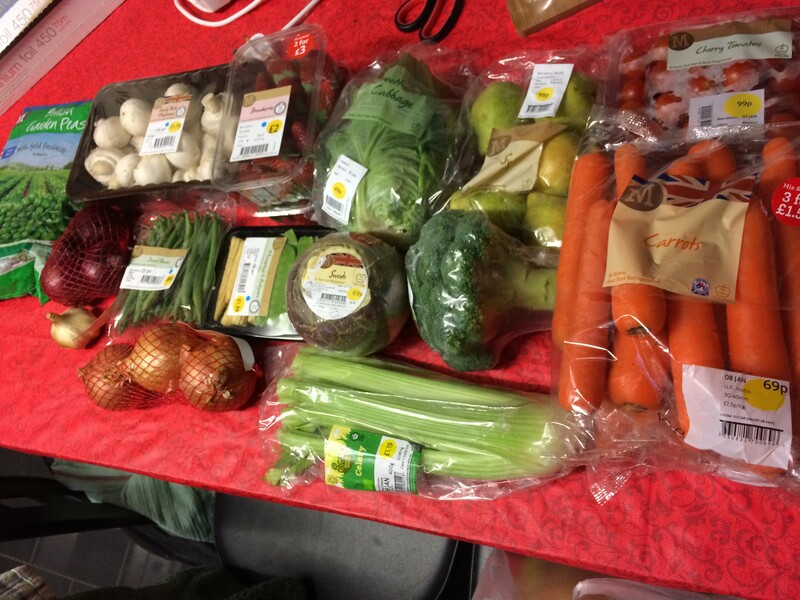 Fruit & Veg: packet of frozen peas, family pack of mushrooms, 2 punnets of strawberries, a head of sweetheart cabbage, a bag of sweet pears, two bags of carrots, a head of broccoli, head of celery, swede, mangetout/baby corn pack, onions, red onions, dwarf beans and smoked garlic. So yeah I felt like treating myself to some sweet stuff just to keep the edge off! The jelly tots bags are quite big so as I don’t want a massive sugar rush I will be halving the bags as that’s more than enough for a sweet treat. Just a quick food shop update today. I spent a little more as I got a few things for OH’s Christmas snack box which isn’t on the list but I thought I’d mention it anyway. 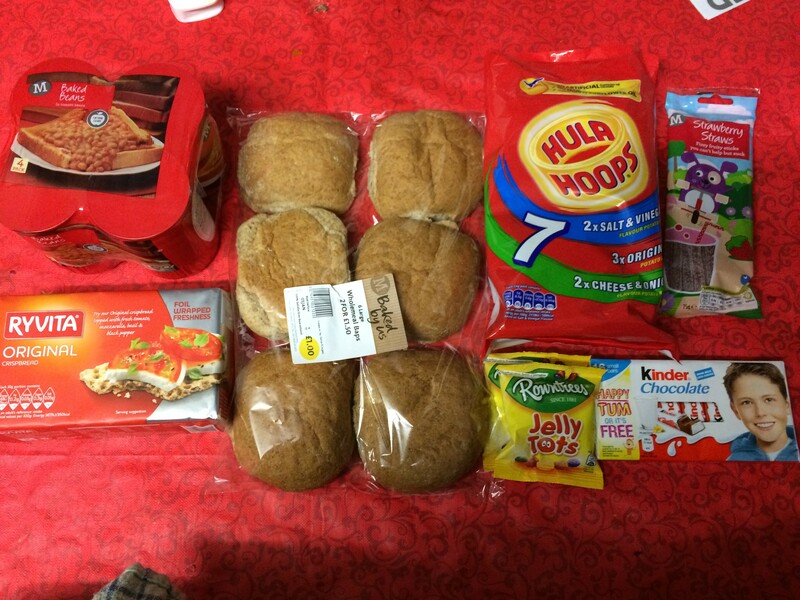 Total including all the snacks for him was £53.17 but I’ll update you on the total below. Everything else: Cathedral city mature selection bag, 2 Cathedral City vintage cheddars (on offer), sliced ham, pickled beetroot, Philadelphia Light with mediterranean tomatoes, cheese stick, jalapeño hummus, onion and garlic dip, low fat thousand island dressing, can of chickpeas, jalapeño coleslaw, value coleslaw, tarragon, bacon. I don’t think the total would have been that high if I hadn’t lost it half way through and smelt the bread! Meant I bought a few things which were off plan and totally random! Also stocked up on my favourite Cathedral City vintage cheddar as it was only £2 a block and BBD was March 2015 so it’ll last a couple of months! Mental note for last time – STICK TO THE LIST! Also picked up my first £5 voucher on the Morrisons Match & More Card – I think I’ve been shopping three times to get it and collected on my fourth shop so will be using that probably just after Christmas (voucher expiry is a year later so plenty of time to use it!) as I plan on using the £15 off a £60 shop at Aldi to get all my Christmas shopping in later this week. Hope you’re all well! It’s that time of the week again and I popped to Morrisons as I’m currently taking full advantage of their Match and More card. My shopping today took me to my first £5 voucher which I’ll be collecting on my next shop. I’m really surprised at myself today as I didn’t get much at all. Saying that though, I decided on lugging a basket around and it was full to the brim! One deal that really caught my eye though, was that Morrisons are currently doing 3 packs of veg for £1.50 which includes carrots, onions and sprouts which I thought was a bit of a bargain as they’re around 1kg packs. 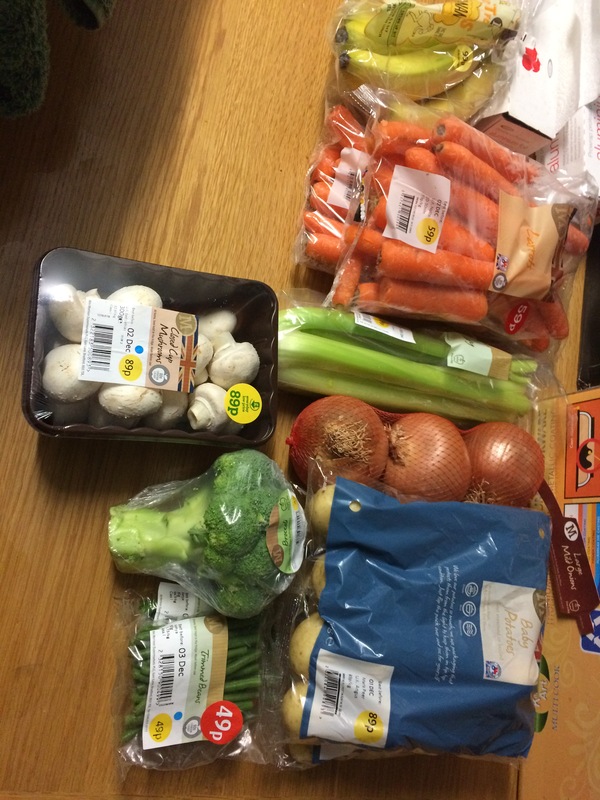 Above – bunch of bananas, 6 wholemeal baps (each are 60g – HEB), 2 packs of strawberries, small box of clementines, celery, mushrooms, 2 packs of carrots, tomatoes, sprouts, red onions and green beans. 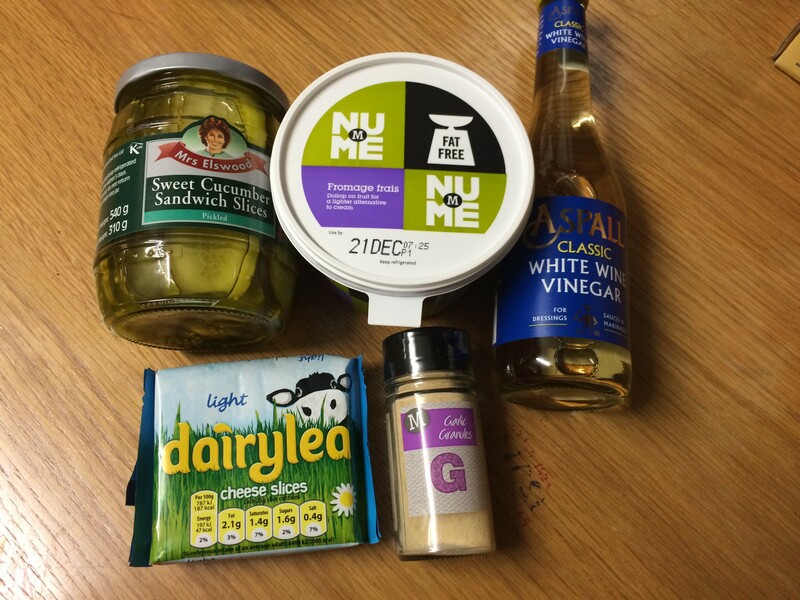 Gherkin slices, fat free fromage frais, white wine vinegar, garlic granules and light Dairylea slices (2 are a HEA). I think I’m thinking more about my meal plans and how many meals they can actually last me for. Also my OH has been on a cooking storm of his own and hasn’t been really eating with me (I think I only shared the beef stew with him last week) and I have a couple of meals planned which don’t really have much in the way of ingredients. Anyhow, my meal plan will be up tomorrow guys. 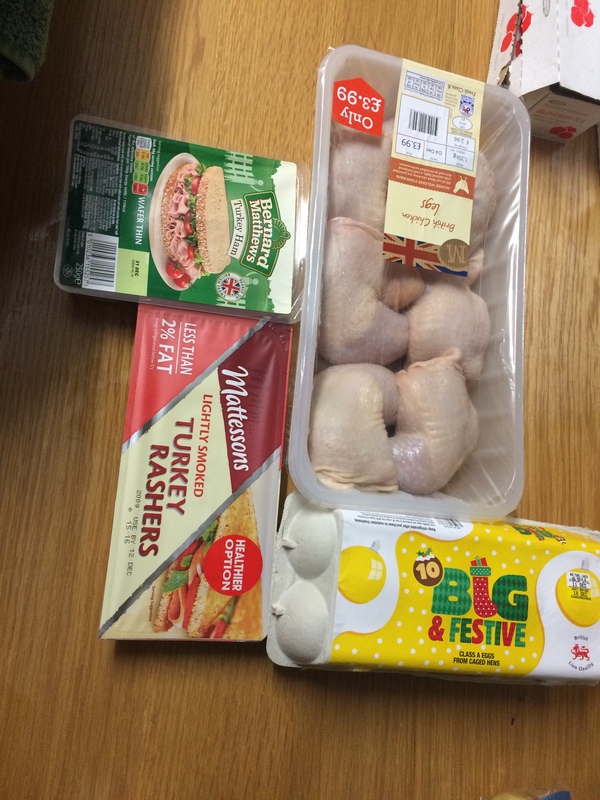 Another food shopping blog from me. This week wasn’t as crazy as last though I’ve just realised I’ve forgotten something so may need to pop by again in a few days or so. So this week I just popped into Morrisons as there was a £5 off voucher off fresh fruit and veg in the Sun which I wanted to use. 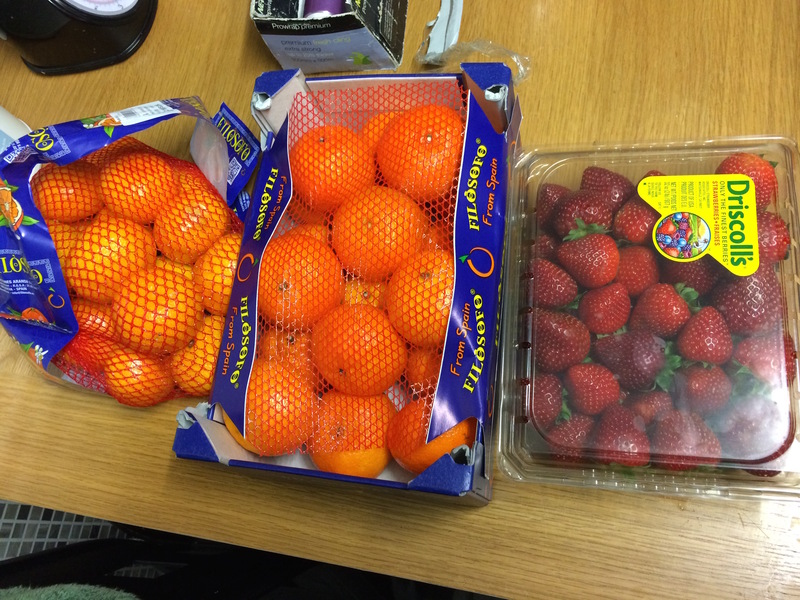 As I bought so much fruit and veg last week, I still have quite a bit left over – a melon, half of the punnet of strawberries, half of the clementines, half a pack of mushrooms, half a pack of sprouts, a pack of passion fruit, cheese and pears (there’s probably something I missed out!) so I just stuck to the staples. 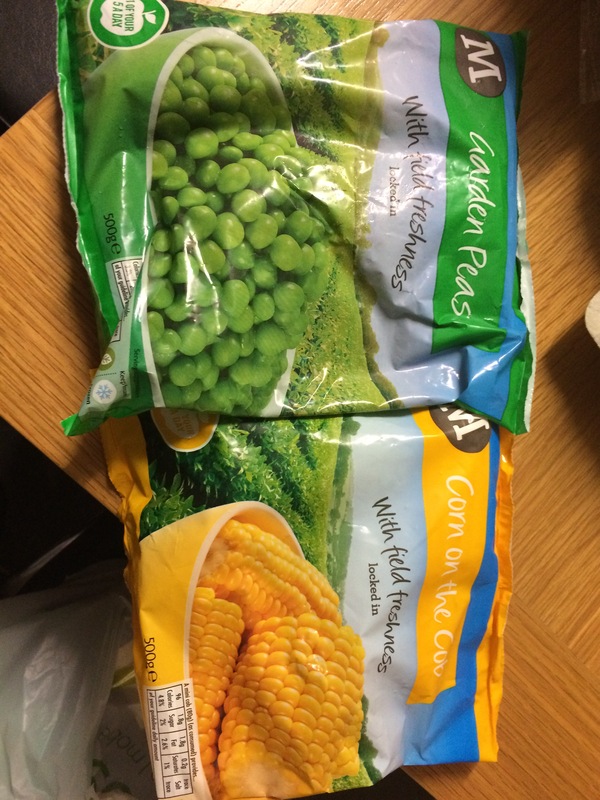 Frozen items: garden peas and mini corn on the cob. So here’s my shopping for about a week and a half I reckon. I originally went to Morrisons as it was on the way home from work but I ended up having to do a top up shop at Asda where I usually go. I stopped by Costco for some fruit as they do the best clementines and strawberries plus we get our house toiletries, etc from there as it’s a bit cheaper. 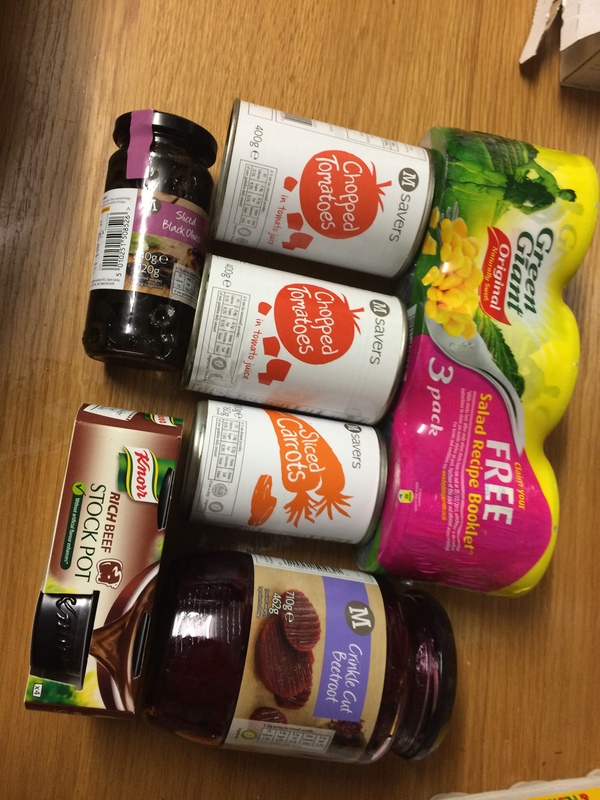 Above haul from Asda and Morrisons. 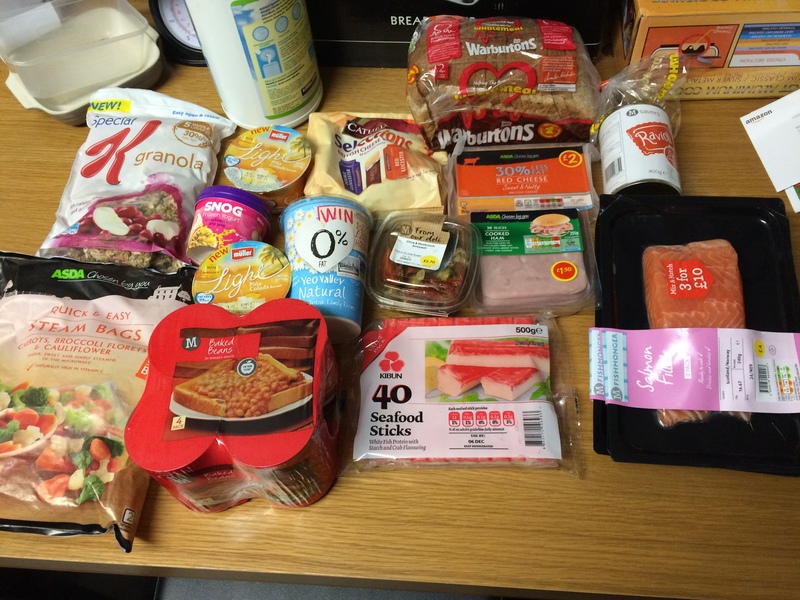 There were a few bits that I already had so it was mainly fresh stuff that I bought. 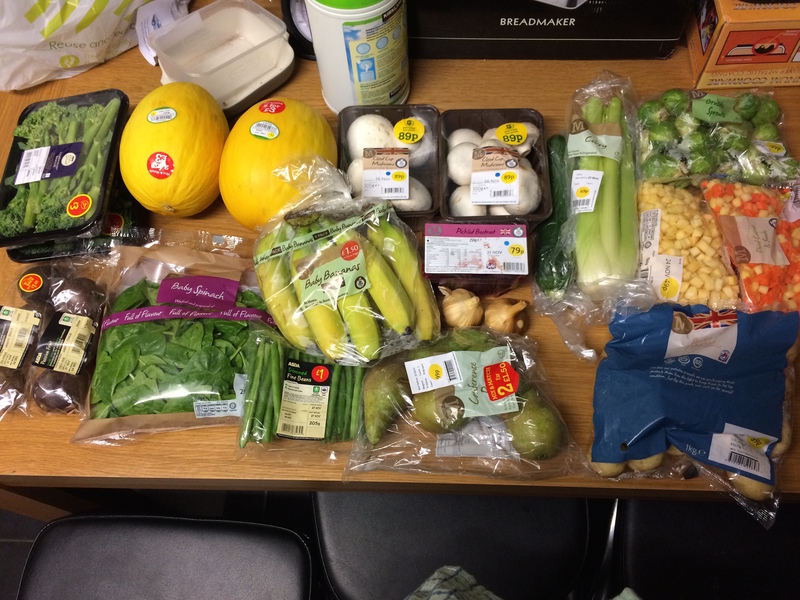 Fruit & Veg: 2 packs of tender stem broccoli, 2 honey dew melons, 2 packs of mushrooms, a courgette, celery, sprouts, pack of carrot & swede mix, pack of diced swede, 2 packs of passion fruit, baby spinach, green beans, bananas, pears, 2 bulbs of smoked garlic, pack of new potatoes. Other items: Special K granola with apples and sultanas, 2 pina colada Muller Lights, 1 Snog passion fruit frozen yoghurt, 0% fat free natural yoghurt, pack of 3 mixed Cathedral cheeses, pot of mixed olives, 400g wholemeal load, block of reduced fat red cheese, sliced ham, tin of Sainsburys Saver ravioli (syn free! ), 3 packs of salmon (on offer), a big pack of seafood sticks, 4 pack of baked beans, pack of frozen mixed veg steamer bags. From Costco: clementines bagged and a case (these last a while! ), 1kg punnet of strawberries. In terms of cost it was a little high but I think a lot of it will last me around a week and a half at a stretch and with the salmon two packs will be going in the freezer for future weeks. I must also stress that I don’t use a lot of frozen veg and some of my personal preferences means that I will go for “higher quality” e.g. tender stem broccoli over normal. 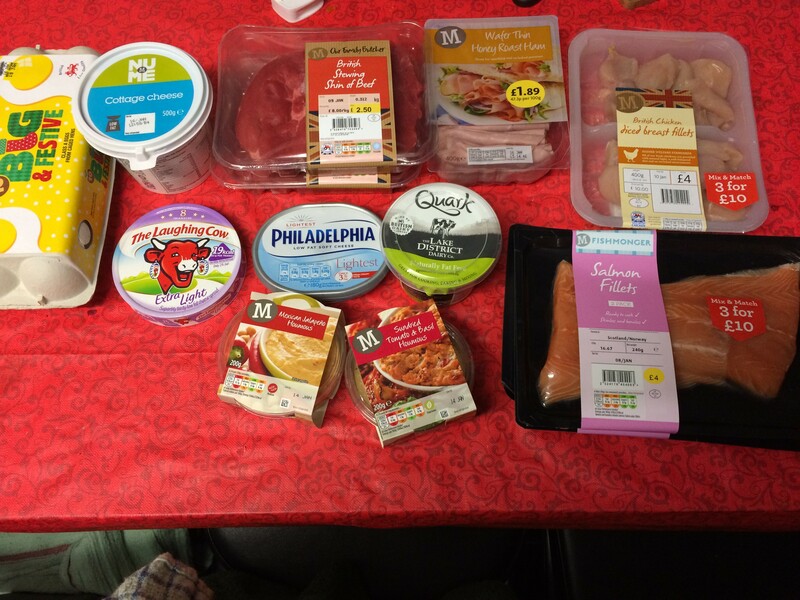 Slimming World can be done on a lot cheaper, I’m just a bit of a fuss pot! Some of the meals I’ll be making I’ll probably freeze half of the batch in case I have a night where I just can’t be bothered to cook. So it is going to look a lot when you look at my meal plan. As I mentioned in a previous post, I’ve just had a really big meat delivery and I also had lean mince leftover from a previous Morrison’s offer. I might do a post on what is left so you can see. I try not to have too much waste and next week I’ll try and incorporate any stuff I have left. I’m not sure if you’ll find it useful or if you read this thinking “omg that’s a massive spend a week!”. There is me and my OH. He shares some meals with me but he is allergic to egg and wheat so it can be difficult, especially as some meals he will just refuse to eat. It’s ok though as he is a real skinny minnie and he needs to put on a good few pounds. We are very much the opposite when it comes to weight and body size. Anyhow, I hope you’ve enjoyed reading and I might make this a regular blog feature.